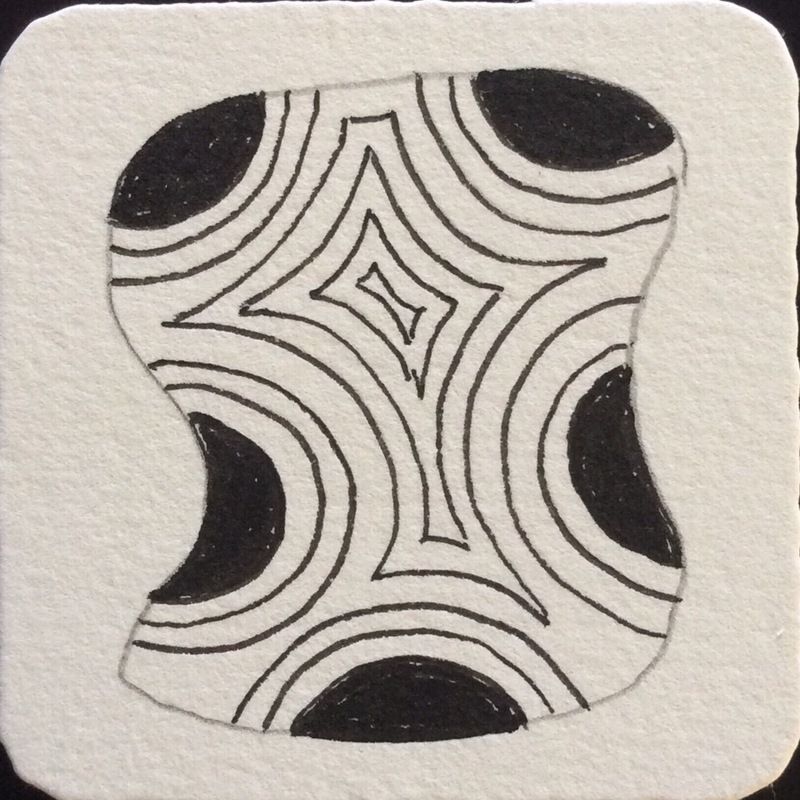 One simple pattern can create a small masterpiece with Zentangle. You don’t even need to plan out a drawing strategy. Just let your creativity flow. 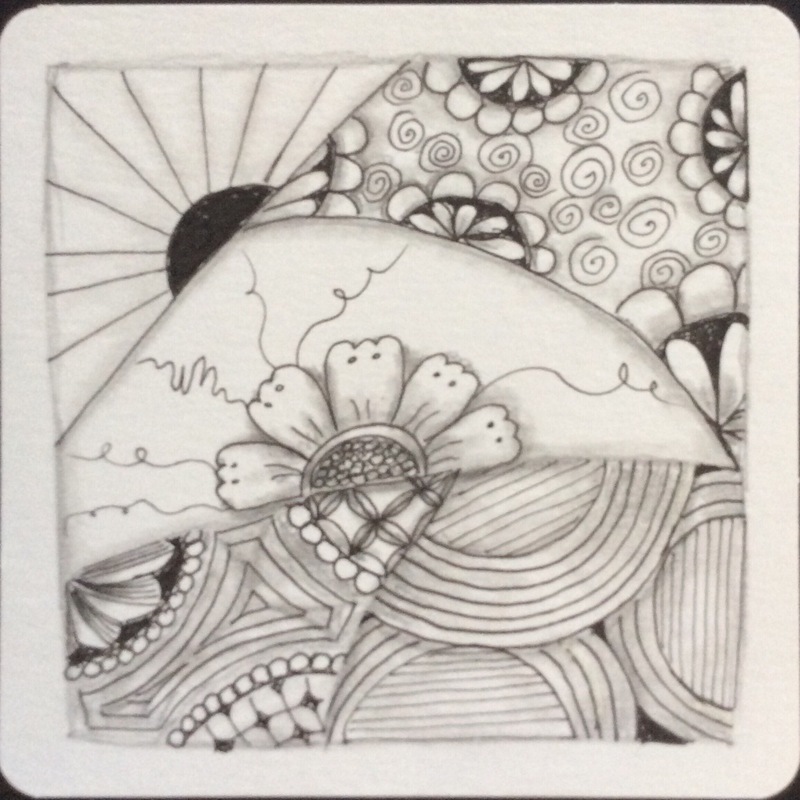 One of the things that drew me to the art form of Zentangle is that it is art that is supposed to be unplanned. That is, there is no preconception of what the result will be. Instead of a rough draft of s subject, the starting place for a tangle is most often the string. The string itself is a random line or sets of lines that create spaces to be filled with patterns. With most art forms, a sketch of the subject is often drawn on the surface. For oil and acrylic painting, it is often a charcoal sketch on canvas. A light sketch often gets drawn on watercolor paper before paint is applied. For drawing, a rough graphite silhouette of the subject is sketched onto paper in such a way that the graphite can be blended into the finished design. But in Zentangle, only the drawing spaces are delimited lightly in graphite, and these boundaries are blended into the shading of the contained tangles, if the lines have not disappeared entirely into the designs. At first, new tanglers learn a few patterns at a time. 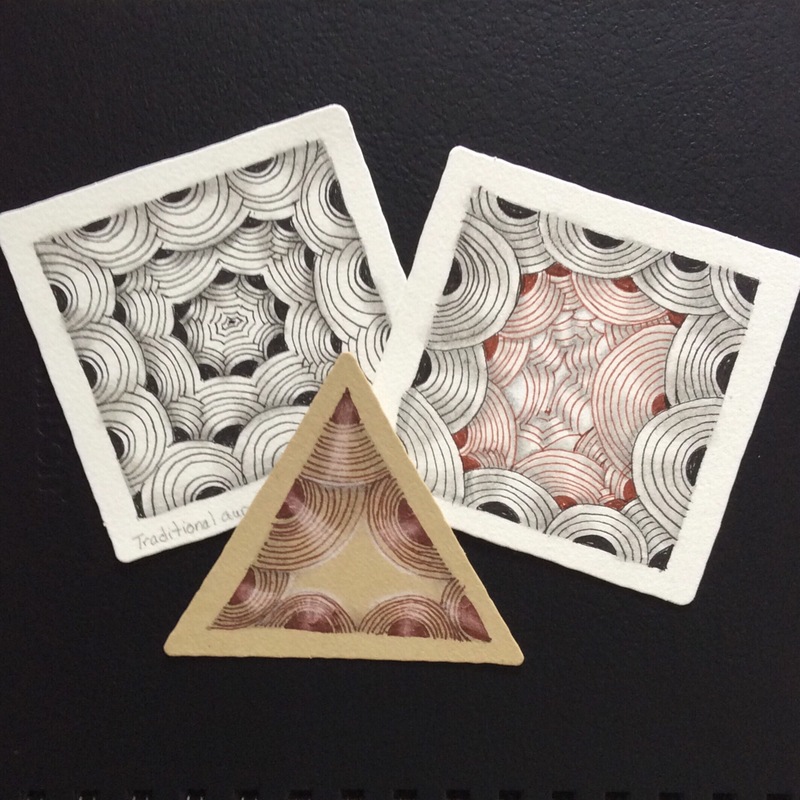 The first pattern taught in the Zentangle Primer and in most workshops is Crescent Moon. It is a simple pattern consisting of an inked in half circle and half halos, or auras. Auras are added individually until no more can be added to one of the half rounds. Then a sort of “collective aura” continues the effect. Without shading, Crescent Moon doesn’t seem to have much to recommend it. Even with shading, it may not look like much. So why is it the usual “first pattern” taught? For several reasons. First, it introduces drawing within a small space. It is a pattern that can be easily drawn all along a boundary. The ladybug shape is small enough for easy inking in. Because of the shape, if the ink fill goes beyond the outline, the shape can be made a little bigger to accommodate the slip of the pen, especially if the shape is filled in before an aura is added. Second, adding one aura gives the individual pattern a bit more flair. Both the “ladybug” and the aura are quick and relatively easy to draw. Adding more auras until the area is filled makes quick work of filling the space. Third, the concept of drawing an aura around shapes comes up over and over in embellishing various basic patterns. Tanglers refer to this as “auraing,” and use it frequently to add interest, to help a delicate pattern stand out, or to separate one pattern from another. Auras are generally kept as even as possible around an object–at least, at first. Also, drawing auras differtly–for example, several auras around one element before moving on to drawing auras around another–can yield a very different effect. Fourth, Creacent Moon can be shaded in a variety of ways to give it different looks. Note the different effects produced by a combination of different ways of auraing and different shading. Suddenly, a simple Crescent Moon section becomes so much more! What else can be accomplished with this single and foundational pattern? The auras can be omitted, for one thing, and the ladybug shape can be surrounded by something different, such as straight lines radiating from the basic shape. Instead of filling the shape with black, it can be filled with interior auras or different patterns. The sky’s the limit on possibilities!